Judge Dredd, lest we forget, is an ultra-macho big chinned lawman of the future has been appearing in the British comic 2000AD since 1977. Inspired loosely by the characters Clint Eastwood played (particularly the Dirty Harry films) but transferred to a futuristic setting, Dredd dispenses instant justice to the masses of Mega City One, a chaotic post-apocalyptic metropolis built on the ruins of New York. 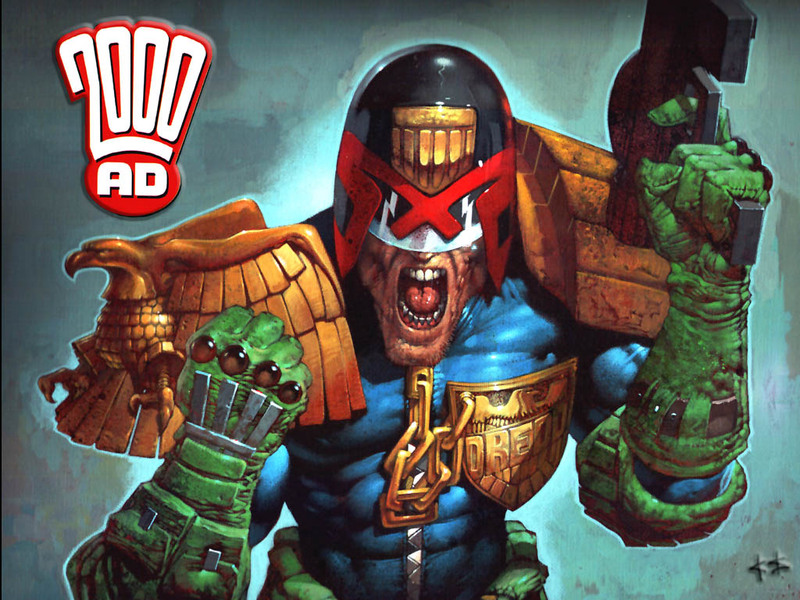 Dredd is just the foremost of many “Judges” who are effectively imbued with the powers of police and judiciary and can sentence “perps” on the spot. So is Dredd gay? Certainly, I never remember much about him having any sort of love life when I read the comic. But it seems not. Apparently the character in the strip is not Dredd at all but someone in fancy dress as the judge, at a gay club. As Dredd never removes his helmet and all judges look pretty much the same with their helmets on, this would actually be a fairly easy disguise to perfect, assuming you had the requisite chin. Presumably the story was a ruse to boost sales just as the second film version of Dredd comes out on Blu-ray/DVD. The news is a bit disappointing in a number of ways. Firstly, the current author of the strip, Rob Williams has said Dredd “may well be gay, straight or bi” but that was secondary to his passion for the law. “Although, can you imagine what would happen if that repression ever fell away, just for an instant? Sure, Dredd could be gay,” Williams said. So why not make him gay then? Dredd is often referred to as a “fascistic” anti-hero but only in the sense that civil liberties and democracy are ignored in his world. Sexuality rarely comes up in 2000AD. And making Dredd gay could have been a major coup for the comic. It is a missed opportunity. Worse still, is the reported reaction of some fans to the news of Dredd’s possible sexual orientation. Some have apparently threatened to burn their 2000ADs. I’ve always liked to think sci-fi fans are an open minded, liberal bunch. Unfortunately a fair bit of evidence suggests that at least some of them are anything but. Witness the absurd reaction to the news that Star Trek Voyager was to feature its first woman captain in the 1990s. Similarly, some seem to have missed the satire of a story set in a fascistic future by reacting to the news of Judge Dredd’s rumoured gayness by responding in a decidedly fascistic way themselves. It is odd that science fiction fans so accustomed to stories set in the 22nd, 23rd and 24th centuries, so often still seem to have attitudes rooted in those of the 19th. I always imagined him to be without sexual feelings of any sort.